You’re never too old to make a card for that special someone! Join us at the Little Italy Food Hall for some family fun on Sunday, February 10. 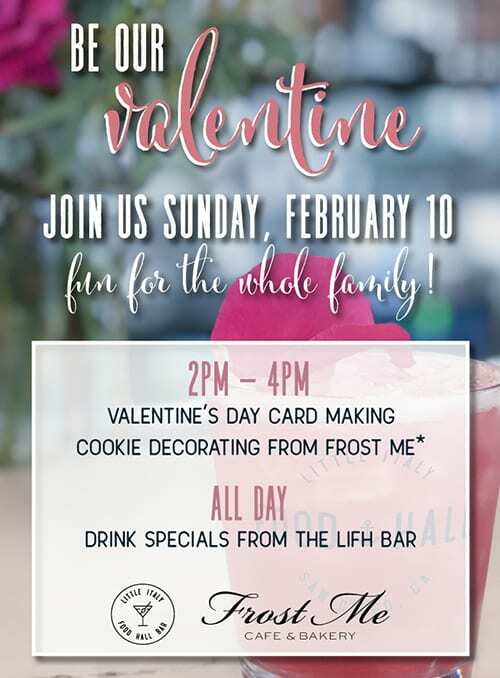 Heart-shaped cookie decorating from Frost Me Cafe and Bakery (while supplies last) and Valentine’s Day card-making from 2pm-4pm. Cocktail specials available ALL DAY until February 14th at the LIFH Bar. 2 for 1 mimosas, #single shots, and a craft cocktail made specially for all of you hopeless romantics. Bring your loved ones and enjoy some delicious cocktails on the Piazza!